In 2011, Annie Yonas and Griffin Kerstetter were friends who separately found themselves struggling with the revelation that some don’t have a place to call home. “I was reading a book about homelessness,” says Annie, who was 7 at the time. “I was listening to the president’s state of the union address,” says Griffin, then 8. All those years ago, when the girls’ eyes first opened to homelessness, Annie’s father and Griffin’s mother, both professors at the University of Pittsburgh, were working on a research project with Adrienne Walnoha, the chief executive officer at Community Human Services, which serves the homeless and working poor. The parents brought their daughters’ questions to Walnoha independently, not realizing the natural collaboration in the offing. The parents introduced the girls to Walnoha, and the three of them started brainstorming how to move forward. Annie and Griffin wanted to be able to hand homeless kids something they could take with them, something like a stuffed animal. Walnoha convinced them a more functional gift might be better. They decided to make quilts out of T-shirts with the idea that a quilt could be a security blanket as well as a source of warmth. 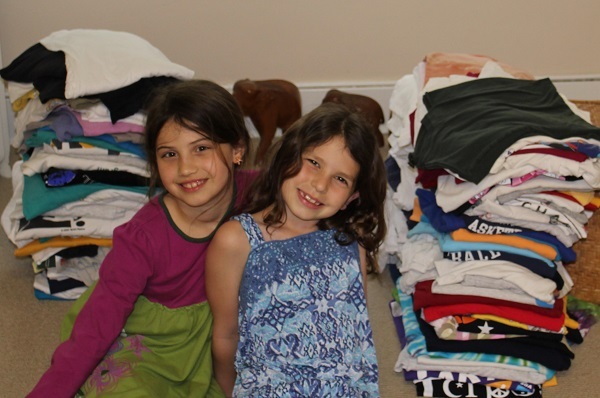 Annie Yonas and Griffin Kerstetter with a collection of T-shirts in the early years of the HomeLost Project. Soon after, with the help of Annie’s mother, Jessica Burke, the girls incorporated the HomeLost Project as a nonprofit. The girls run the show. Walnoha’s role in the HomeLost Project is strictly advisory. The T-shirts, which originally came from the girls’ second-grade classroom, now come from all over, including Community Human Services and local organizations that have leftover shirts from events they have sponsored. 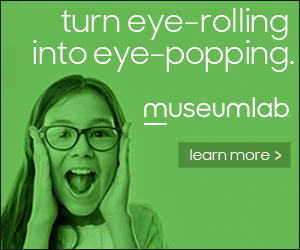 They also solicit T-shirts through a Facebook page and a professional website that Griffin built herself. The website includes instructions on how to cut the T-shirt squares, as well as how to make a quilt. Donations are arranged through Community Human Services. They have collected so many shirts that these days they keep them in a storage locker. Bob Nelkin, president and chief executive officer of United Way of Southwestern Pennsylvania, met Annie and Griffin years ago at a sleep-in in Market Square sponsored by Community Human Services. 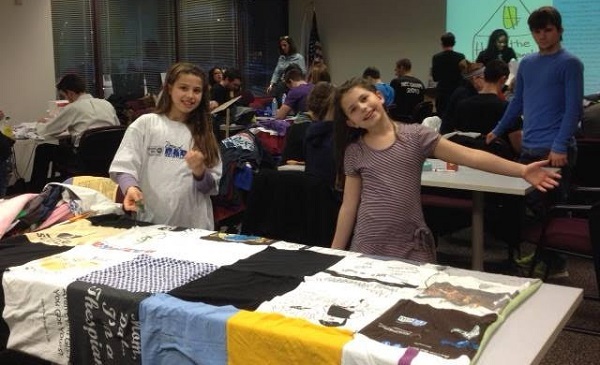 The girls were there with college students who were cutting T-shirts for quilts. Nelkin was impressed with the young ladies and offered them support. At regularly scheduled sew-ins, groups of volunteers work with Annie Yonas and Griffin Kerstetter to build quilts from T-shirt squares. Working with the United Way Women’s Leadership Council, HomeLost Project brings in people of all ages, including many families. They set up large tables with sewing machines where 40 to 50 people sew the T-shirt squares together. The girls figure they have produced more than 300 quilts since 2011. Seven years later, Annie and Griffin recently took home the first “I Do What I Can” award, a collaborative honor from the United Way of Southwestern Pennsylvania and The Fred Rogers Company. The award was part of the Good Neighbor Day Awards ceremony. While they are still very young, Nelkin is impressed with how Annie and Griffin have grown. He credits multiple influences, including their parents, for their maturation from the shy, reserved girls he met at the sleep-in in 2011. Kids can only achieve awareness like Annie and Griffin when allowed to experience the world as it really is, Walnoha says. Their parents haven’t tried to hide life’s less happy things from them, she says, and have gone to great lengths to discuss the tough issues. The girls, in turn, have met the world head-on, interviewing homeless families themselves to learn how homelessness happens and what the girls can do that might be meaningful to them. Now students at Dorseyville Middle School, Annie and Griffin expect to keep working on the HomeLost Project until they head to college when they’d like to hand it over to another generation. They hope to be welcomed back to participate in quilt sew-ins, of course. They are under no illusion that their quilts will solve the scourge of homelessness.